Rebooting India is an uplifting account of a transformative government IT project. It makes The Tears of the Rajas about imperial rule in India feel a long time ago. Rebooting India is one of the most inspiring books I've read in years. Given that its subject matter is a government IT project, that might also be one of the most surprising sentences I've written in years. In the UK, the phrase 'government IT projects' just generates massive grumpy old man rage. Put it into Google and you get a torrent of 'Why do all government IT projects seem to fail?' headlines. Take government IT and combine it with another depressing topic, the public sector in India - infamous for horrible corruption, hopeless inefficiency and pointless bureaucracy - and you have Rebooting India. So how can that ghastly combination tell an inspiring story? Nandan Nilekani is co-founder of Infosys. Time magazine calls him 'the Bill Gates of Bangalore', and includes him in a list of the 100 most influential people in the world. (Declaring an interest, I know Nandan a little personally, after 20 years in Bangalore IT.) Since Infosys, his project for the past five years has been the Unique Identification Authority of India (UIDAI) - a government agency whose mission is to provide every Indian with a 12-digit Aadhaar number (Aadhaar means 'foundation' or 'base' in Hindi). This number gives them a unique verifiable identity, based on a small set of demographic and biometric data. And what's amazing is that the UIDAI has almost completed its mission! Over a billion of India's 1.25 billion people have had their names, addresses and birth dates recorded, been fingerprinted and iris-scanned, been 'de-duplicated' to check their data sets are unique, and received their Aadhaar numbers. Now all they need to prove who they are is to quote that number and be biometrically checked, and that's true even if they are completely illiterate and their address is 'the shack by the large mango tree behind the post office'. This is an amazing feat. It has overcome political and bureaucratic resistance. It has generated technological breakthroughs such as the massive computing needed to store and de-duplicate a billion iris scans. The authors (Nandan's techie co-author, Viral Shah, also worked at UIDAI) see the programme as a platform for delivering multiple services. At least a third of India's welfare spending is siphoned off or lost before it reaches intended recipients. But an Aadhaar number can allow even the poorest disconnected citizen to open a micro bank account in their village and receive welfare payments. Such direct benefit transfers can also eliminate inefficient and corruption-ridden subsidies for essentials. On these two fronts, over 200 million Aadhaar numbers are already linked to bank accounts; and the old LPG cooking fuel subsidy (PAHAL) is paid as a direct bank transfer to 140 million consumers. The authors go on to lay out a manifesto for how India can be comprehensively transformed by applying similar technology-led programmes. With breathtaking hubris but also disarming energy and optimism, they say that an A-Team 'of 100 carefully selected individuals can fix all the problems that ail India'. Wow! If, like I have, you've suffered Bangalore's infrastructure nightmare for 20 years, you'd think, that's nuts, India is unsolvable. But after reading the Aadhaar story, you think, well, maybe that's right, mad though it sounds. 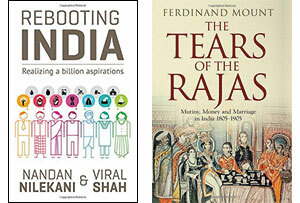 MT threw another newish India book on my pile, for a bit of compare-and-contrast - The Tears of the Rajas. It's about the latter East India Company era, 1805 to the company's dissolution in 1858 and the start of The Raj. It is classic Boy's Own Paper stuff, full of manly cavalry charges, horrible mutual atrocities, and the underlying scramble for filthy lucre. It is actually a very good read. The main feeling is how distant that not-very-distant time now feels. In my lifetime, British India has become as remote a concept as the Roman Empire. How about a bit of modern reverse colonialism? Maybe Nandan and Viral could pop over and fix the UK's government IT projects? We could do with some thin solutions over here.